This sky map shows how the constellation Coma Berenices appears in the southern evening sky at 9 p.m. to night sky observers at mid-northern latitudes. The constellation Virgo, planets Saturn and Mars and bright star Arcturus, is also visible June 16, 2012, near the star pattern. This week, if you look high in the west-southwest sky once it gets sufficiently dark, you might be able to glimpse a cosmic "hairpiece" that appears as a faintly shimmering patch of light, about halfway between the handle of the Big Dipper and the tail of Leo, the Lion. On more than one occasion when I have presided over a star party or public viewing session in the spring or early summer, somebody inevitably will ask me what this hazy cloud patch is. And my usual retort is: "Believe it or not, you're looking at the celestial wig." With that, I launch into the story of Berenice’s Hair. 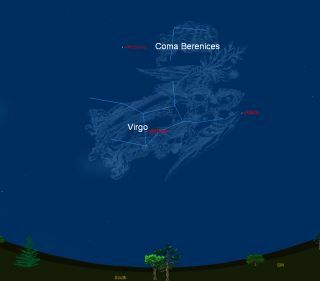 While virtually all of the constellations are named for mythological people, beasts and inanimate objects, Berenice's Hair (known as Coma Berenices) is actually associated with a real person. Eratosthenes, in the 3rd century B.C., was among the first to make note of this faint group of stars. This pattern of stars is actually a large, loose galactic star cluster some 250 light-years away. To the unaided eye, it appears as a faint patch of light on clear moonless nights. As a cluster, Coma Berenices is by far at its best when seen with a pair of good binoculars. If, on the other hand, you attempt to observe it it with a high-powered telescope, the impression of a cluster will become totally lost because of the telescope’s narrower field of view. Berenice II was an Egyptian queen, the wife of Ptolemy Euergenes (also known as Ptolemy III), the king of Egypt who reigned around 250 B.C. The story goes that Berenice sacrificed her beautiful amber tresses and placed them in the temple of Aphrodite at Zephyrium, as she vowed to do if her husband returned victorious from his war against Syria. Shortly after the royal couple’s happy reunion, however, the hair mysteriously vanished; apparently stolen from the temple. As you might expect, when Berenice found out what had happened she was (to put it mildly) ticked off. But it was Conon of Samos, a court astronomer and mathematician who eventually convinced the disconsolate queen that the gods had taken her beautiful locks and placed them up in the sky for all to admire. Such is the story of how the cluster probably received its moniker, though this region was not generally recognized as the separate constellation of Coma Berenices until the beginning of the 17th century. Initially, in fact, many of the star atlases of that era did not depict this star cluster as a celestial hairpiece. Indeed, in various star maps of the late middle ages the cluster was identified as a rose-wreath or ivy-wreath, and occasionally as a Sheaf of Wheat held in the hands of the nearby constellation Virgo. Others saw it as the hair of Sampson, not Berenice, while still others regarded it as a tuft at the end of the tail of Leo, the Lion. Credit is usually given to the astronomer Tycho Brahe for being the first to officially catalog it as Coma Berenices in the year 1602. In astronomical circles, other “official” designations for Coma Berenices are Collinder 256 and Melotte 111. My very favorite description is the one given to it by the early 20th century astronomer, Garret P. Serviss, who likened our wig to "gossamers spangled with dewdrops." But the sight of Coma Berenices high in the sky is bad news if you are a fan of the Milky Way galaxy. Just to the east of this cluster is the north galactic pole, one of two points in the sky lying farthest from the ghostly circle of light that composes the Milky Way. At the present time during the early evening hours, there is little to be seen of the Milky Way itself; its brightest segment, which will soon become a prominent feature of our mid-summer sky, currently hangs low in the east at nightfall and is most always obliterated by the thicker layer of haze that perpetually rims the horizon. Conversely, when the cluster is setting, the Milky Way appears to arch high across the sky in all its glory. Nowadays, however, you’ll have to get up well before the break of dawn — say at around 3 a.m. — to catch such a view.